Hey, everyone! 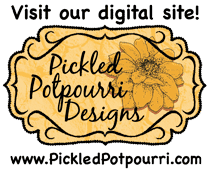 I've had some questions regarding our new Cling Mount Rubber Stamps, so I thought I'd answer them here, just in case you were wondering, too! Q: Now that you have Cling Mount stamps, will you still sell unmounted rubber stamps? 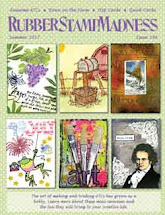 A: I still have plenty of unmounted rubber stamps in the store. These will continue to sell until they are sold out. However, all new stamps will be provided as Cling Mounted Rubber Stamps, as this is what the majority of my customers tell me they want. Cling Mounted stamps also give me more flexibility in how I offer these stamps to you, giving you more choices. This flexibility helps me keep the cost down for you, as well. Q: Are your cling-mounted stamps indexed on the cling side? A: No, they are not indexed. However, you'll find that our new cling mount stamps are cut very close - close enough to see what you're stamping, where. And close enough to give you a perfectly stamped image every time. 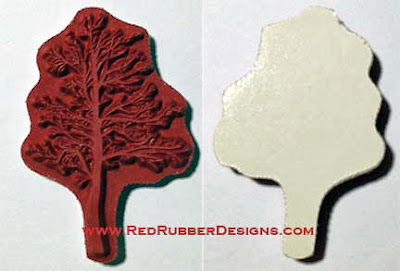 Below is one of the stamps in our Tree Silhouettes set. On the left is the rubber side and on the right is the back of the stamp (with the paper backing still attached). As you can see, it wouldn't be at all difficult to stamp this tree right where you want it. I think you'll be pleased with our new cling stamps - I am! Do you have more questions? Ask them in the comments!